✔ Are you tired of Sundries display? ✔ Are you fed up of not having enough storage space? ✔ Fed up and ready to take action? WE HAVE No-GLUE,No-NAILS,ORGANIZE ASSISTANT THAT YOU NEED! Instant storage solution!!! - Made from high grade (N35) Neodymium. Neodymium is a rare earth metal and is the strongest magnetic material in the world! Small, lightweight and extremely strong. Important to achieve up to 30lbs(50lbs) pull strength the magnet needs to be attached to a horizontal surface - imagine the hook attached to a ceiling with a basket hanging from it. Vertical application the pull force is usually 1/4 weaker. Surface smoothness,steel thickness and the purity of iron and nickel can also have an impact. Thank you for my god give my child a chance to be friend with you，Help you with the problem of sundries display. Return at any time if there are problems with my child and I'm sorry,my child doesn't satisfy you ，please forgive my child and we will give you a full refund. EHOLIFE all staff may you have a better and beautiful life and I love you. ★BIGGER PACK - 2 x 30Lbs(D25MM) or 2x50Lbs(D36MM) Eyebolt Magnets .Stainless steel with a brushed Nickel finish made with a high grade of Neodymium felt pads to prevent scratching. ★ATTRACTIVE DESIGN - Super Strong Small Eyebolt magnet finish looks great anywhere!Perfect for any location! ★MULTI PURPOSE - Can be used indoors/outdoors, the kitchen, bathroom, bedroom, garage, lockers, office, your refrigerator or even on a cruise! The perfect storage solution! 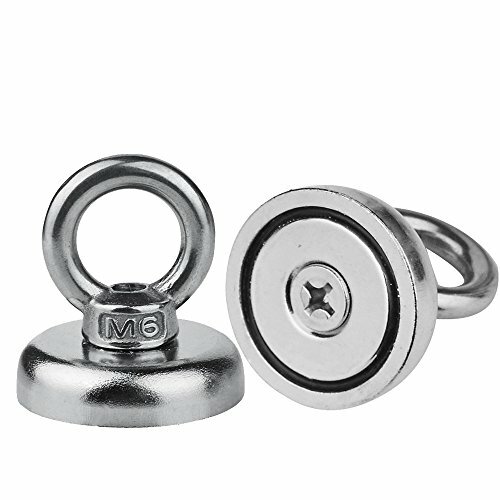 ★DETACHABLE--Remove into screws and Neodymium Cup Magnet 0.216"(D25)/0.255"(D36)Countersunk round base mounting magnet used as tool holder and door latch w/screws, strongest & most powerful rare earth magnets by applied magnets DIY, Kitchen/Garage/workshop Tool Organizer Magnets! If you have any questions about this product by EHOLIFE, contact us by completing and submitting the form below. If you are looking for a specif part number, please include it with your message.